Aims: There are few empirical data to guide the choice of a gait initiation (GI) measure in older people. We investigated the statistical characteristics of the components of GI, their inter-relationships and associations with sensorimotor variables, and the effect on them of cognitive interference. 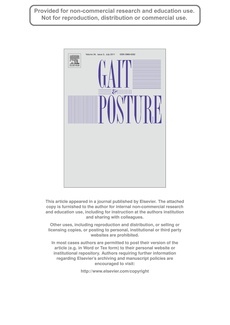 Methods: GI was measured for randomly selected participants aged 60� years using a force-platform with and without a cognitive interference task. Sensorimotor measures were obtained using the physiological profile assessment (PPA), and cognitive speed using the digit symbol and symbol search tests. GI was divided into its three components: time to first lateral movement (FLM); transfer time; and swing time. Six summary indices were assessed for suitability. Regression techniques and Spearman correlations were used to examine learning effects, inter-relationships between components, associations with other study factors and responsiveness to cognitive interference. Results: The median of trials per participant was the best summary index. Learning effects were observed under single and particularly dual-tasking. Time to FLM was most consistently associated with age, height, weight, sensorimotor variables, falls-risk score and cognitive speed, and was most responsive to dual-tasking. Overall time to GI was more predictive of falls risk than was time to FLM. Conclusions: Multiple trials are recommended for GI component measurement and the median may provide the best summary measure across trials. Time to FLM is the GI component measure of choice in older people due to its relationship with other factors and responsiveness to cognitive interference but without advantage over overall time to GI.